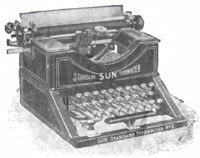 Lee S. Burridge and Newman Marshman designed the first of several very similar linear index typewriters, patented in 1885. Other mechanically similar machines of the time include Pearl, International index, New American and Odell. 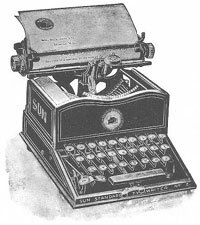 In 1899, Burridge patented a small frontstroke 3-row typewriter with a novel inking device in which the typebars were inked by a roller before striking the platen, and the ink roller itself kept well-inked by a larger booster ink roller. Later models abandon this system for standard ribbon inking. 1884 Introduced in New York market in Fall 1884. Rectangular wooden base, 4.5 lbs, 12" long by 8" wide by 3.5" high. Holds paper 8.5" wide. Early versions have metal typeface, later versions have rubber typeface. 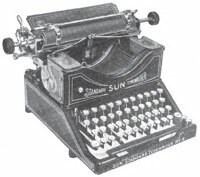 1885 Sun Typewriter Company is incorporated at 317 Broadway, New York, NY, USA. 1890 Lippman claims No. 5 was an index sold by Sun in 1890. 1901 Three row keyboard with 27 keys writing 81 characters, double shift, front stroke. Ink pad inking. Platen length: 9.875". First keyboard typewriter with a sheet metal body. Sold for $40. Optional backspacer, add $2.50. 1911 Included metal case: $65, available in wide carriage: $75. 1912 Sun office still at 317 Broadway. At later date, Sun moves to 239 Broadway, New York.